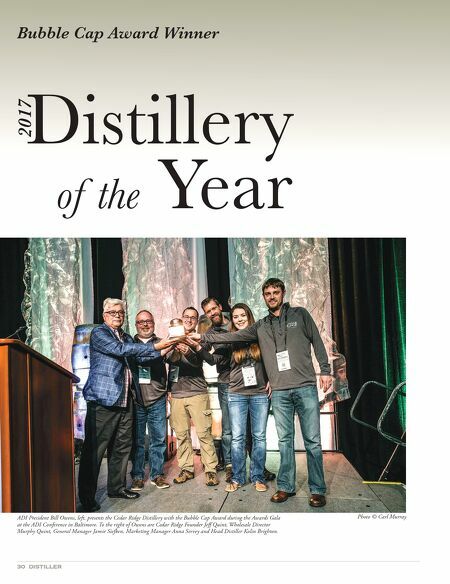 Distiller magazine a publication of the American Distilling Institute, the Voice of Artisan Distilling; devoted to the craft spirits industry: vendors and distillers alike. t t SUMMER 2017 distiller 31 by Eric Zandona and Andrew Faulkner In 2005, Jeff Quint opened Iowa's first grain-to-glass distillery with a 35-gallon Christian Carl still. "It was all the still I could afford at the time," said Quint. "I remember our TTB field agent coming in to do an audit, letting me know I could never make any money with that one little still. He may have been right." However, over the past 12 years Quint has been able to successfully diversify his business, increase his production capacity and aging stock, hire more employees and take steps to mitigate the environmental impact of his production without taking on outside investors. Quint grew up on a farm about 45 minutes north of the dis- tillery in Winthrop, Iowa, and his wife Laurie lived on a farm only a couple miles away. Laurie's family has been working the 800-acre Aljumekaal Farm for three generations. Together they have four children, and their two oldest sons, Murphy and Nolan, work in the family business; Laurie is the office man- ager. Murphy is their wholesale business director, and Nolan is a warehouseman. e family farm grows 400 acres of corn, and the distillery consumes only a small fraction of the approx- imately 70,000 bushels produced annually. Cedar Ridge trucks in the corn 900 bushels at a time. "e corn used in our bourbon is 100% from our farm," said Quint. Cedar Ridge procures the other grains needed for their whiskeys — malt, rye and wheat — from North Dakota via Cargill. Not long after opening, Quint ran into the problem of hav- ing so much local demand he could sell every drop he made. However, selling every drop does not leave room for long-term growth or ability to lay down stock to age. "It took me a while to realize that, in the whiskey business, you must plan out your production and sales many years in advance and then commit to never selling more than your plan," said Quint. After reach- ing a minimum level of profitability, Quint began using a small surplus to focus on production and putting barrels aside to age. "Our production team is, right now, fulfilling our projected sales needs three to five years out, while our sales team is sell- ing our production from three years ago," said Quint. "ere's really no other way to do this over the long term, if you wish to grow." By adding a 200-gallon Carl stripping still and a 100-gallon Carl finishing still, Cedar Ridge is now able to produce four barrels of whiskey a day running two shifts, six days a week. e distillery produced the equivalent of 50,000 nine-liter cases of whiskey while selling only 15,000 in 2016. For 2017, Quint plans to increase his production to 60,000 cases and sales to 20,000 cases. 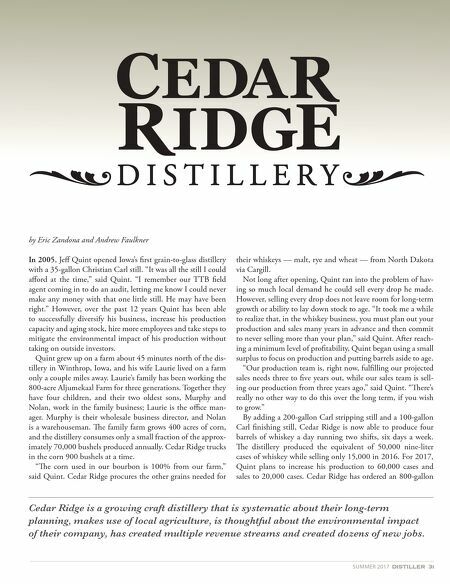 Cedar Ridge has ordered an 800-gallon Cedar Ridge is a growing craft distillery that is systematic about their long-term planning, makes use of local agriculture, is thoughtful about the environmental impact of their company, has created multiple revenue streams and created dozens of new jobs.